San Francisco—The massive wildfires in the North Bay of the San Francisco Bay Area that began on the night of Oct. 8 have sent a shock wave through the entire region. Most here feel that this was eminently preventable. Altogether there were at least 12 fires, covering nearly 400 square miles. More than 8,900 buildings and homes have been destroyed, 100,000 people displaced, at least 42 dead, though there are a number of people still unaccounted for. In some areas, there were actual firestorms and winds so strong that one man described how when he fled to an open space he was almost hit by a burned-out automobile rolled along the ground by the intense winds. He barely survived. There are uncounted numbers of injuries and people suffering health problems, including medical patients who have sustained further problems from the toxic air and from being evacuated. There is so much toxic residue that some officials are worried about letting people return to their neighborhoods. 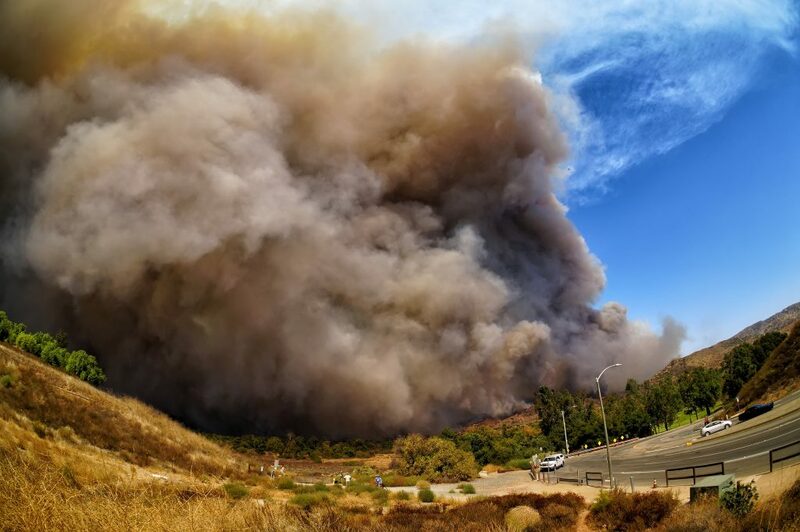 On Oct. 9, 2017, Canyon Fire 2 in Orange County, Calif., caused evacuation of a school directly in the smoke plume. Photo: /\ltus. Many people have suffered trauma that may last a lifetime. A number of those reported missing are undocumented immigrants who may be afraid to come forward, and many other undocumented people may not be able to get even minimal assistance. At the same time, it is publicly acknowledged that undocumented labor will be crucial in the rebuilding of the burned-out areas. The causes have yet to be determined, though the combination of heat and dry air is seen as a major contributing factor. Another is the failure to maintain forests that has been going on for decades. Then there is the problem of electrical wires, which have caused fires in the past. There were reports within 90 minutes in at least 10 locations of arcing power lines and exploding transformers on the night of Oct. 8. Pacific Gas & Electric (PG&E)—already in trouble for the 2010 San Bruno gas line explosion—has not been forthcoming on these issues. Now PG&E is pushing state regulators to allow them to charge customers for billions in liabilities in order to protect shareholders. Last year Governor Brown vetoed SB1463, which would have enhanced the inspection of electrical lines. At the same time there has been a lot of fake news and rumor that the fires were set by “Mexican cartels” or by undocumented immigrants. The behavior of forest fires is well understood, and there are ways to lessen the possibility of fires spreading. Many things point to a failure of the government to support reasonable and adequate fire safety in rural and forested areas. At the same time, huge sums of government money have gone to pet projects that the governor and various legislators have promoted, largely infrastructure projects for the rich (such as an unneeded new Bay Bridge), which have drained the state budget. Though the fires have subsided for now, the questions and consequences of this tragedy have just begun to be faced. This story is not over by a long shot. This entry was posted in Articles and tagged 2010 San Bruno gas line explosion, D. Cheneville, global warming, Governor Brown, Orange County California, Pacific Gas & Electric (PG&E), San Francisco Bay Area, San Francisco California, SB1463, undocumented immigrant, wildfires. Bookmark the permalink.